So is that what this is. Finally information pertaining to girugamesh‘s July single release has been released. But honestly, at this point I couldn’t care less about the track-list. Honestly, I’ve already decided to buy the single, so as far as that goes, it’s not like I was waiting around for anything. However, there is something vitally more important that happens when new singles come out (particularly at seasonal-junctures): the band changes their look. I see what you did there, Visual Kei. I take it back. I take back all of the 5 scathing posts, the unflattering pictures (in my defense, isn’t it your responsibility to always look flattering on film? ), and every wrong I’ve ever done The Perm. Just take the freaking hats off. For anyone who hasn’t seen any other mad-hatters running around, for their latest single LOVE IS DEAD, D’espairsRay vocalist Hizumi was also pimpin’ a hat. Granted, he looked more like a 1920s gender-confused mafioso rather than some sort of hobo (lookin’ at you, Nii). That said, however, because I think the new look is really quite cool and moving in the direction of fashionable, I’m going to let them off easy this time. Oh, and because it would appear that Nii finally got off the streets– maybe he’s just hiding a bald-spot now. Again, I think the look of all the members this time around is actually quite cool. It’s downplayed and casual– denim, the signature black skinny pants, etc. The simplicity is cool because although the outfits probably aren’t anything you couldn’t see on the streets of a chic Tokyo neighborhood, within the scope of Visual Kei they feel fresh and minimalistic-stylish. A lot of the more vet bands these are starting to lay off the psychotic peacock hair-styles and everything…I’m not saying anything against those styles, as I think many of them are quite awesome as well, it’s just that as bands mature, I respect it when they can adapt their look as well. I’m also digging Satoshi’s lack of visible makeup. I guess I can stop secretly referring to him as “Raccoon”. And yes, I do happen to be rebelling against Visual Kei typography by refusing to type his name with a backwards R.
And Shuu is….Shuu. What can I say? Well, let me try: the harem pants will never die? The harem pants should have died? Most metro-sexual people understand the general rule that one does not pair a baggy T-shirt with harem pants? The harem pants should be left in Aladdin? Unfortunately I was a bit disappointed with this final look. On that note, though, I was not disappointed remotely by their cover designs. After NOW‘s total failure of an album cover, I was lying awake at night biting my nails over how they would scar us with the new one. It looks like they’ve captured their new theme/style well both look-wise and in the cover. No scarring– just more gloomy cool. I personally prefer the Ltd. type (which is weird, because for some reason I often prefer the regular type). I think their pose is cooler, and the color scheme is undeniable. Have you ever gone gambling before? Well, here’s your chance to gamble and win. On May 19th, L’arc~En~Ciel bassist, Creature Creature partner, and solo-artist Tetsuya will release a brand new single, Roulette. 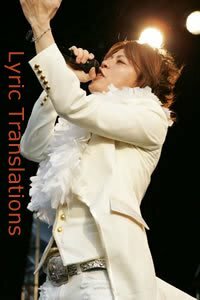 Tetsuya, who was previously solo as “Tetsu69”, first started making his voice heard (literally) to L’arc fans with the L’arc~En~Ciel mirror project P’unk~En~Ciel which appeared as b-sides and other-versions on singles and albums. P’unk~En~Ciel showcased L’arc members’ variety and talents by rearranging the roles of its members. Hyde switched off to guitar, and Tetsuya took over the vocals. The sound also changed to something much more punk and indie feeling. My first introduction to P’unk stuff was the song I Wish, which I thought was way too catchy and awesome. I didn’t get full Tetsu exposure until I found his solo album (Suite November) in a used CD shop in Japan. It’s a mellow, but great, collection of chill punk-pop that any Tetsu or L’arc fan should own. In 2009, Tetsu turned 40 (yeah, he still looks younger than most 20 year olds), and (although I’m not sure whether the two events are related or not) dropped the slightly sketchy Tetsu69 stagename and went straight with “Tetsuya”. Roulette will be his first single under the name Tetsuya. Also check out the release information for their newest single, collaboration with a.b.s‘ Kishi Toshiyuki, LOVE IS DEAD. The band also hinted on their official Facebook page that they will be making announcements soon(ish) [their words, not mine], one for Taiwan (that was the Megaport Music Fest appearance, which you can check out on my Lives&Tours information page) and one for Europe. And? And, D’espairsRay, AND? You mean three announcements right, because I haven’t heard of an announcement for the US yet!